All abilities & styles welcome. Class or private coaching (including MMA), taught by a qualified IBJJF registered Black Belt instructor (training weekly with his Brazilian professor) – Also Black Belt in Thai boxing/traditional Jiu Jitsu – qualified in Advanced Sports Exercise Nutrition & First Aid, DBS checked. Classes take place in Chandlers Ford and Winchester – opportunity to roll with all grades including other Black belts! Our club is registered with the UKBJJA . 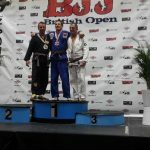 NEWS REGARDING WHO SHOULD TEACH BRAZILIAN JIU JITSU – ensure you read HERE when choosing where to train as it affects all grades except black belts.. Instructors liability insurance & registration are critical, check you’re covered when you train, this is a contact sport! CHOICE OF THREE CLASSES TO BOOST YOUR TRAINING..! WE HAVE MOVED – due to the expansion of the club we now have much bigger more modern venues to train at! Ultimate BJJ now have an MAXINutrition team account offering huge discounts on supplements! Contact Us for more info. Brazilian Jiu Jitsu (BJJ) is a martial art for men, women and children. A great way to keep fit, lose weight, gain confidence, learn self defense and relieve stress. Leave classes feeling re-energised and with an increased level of self-esteem! Catering for the Southampton, Eastleigh & Winchester area. This site is going through some progressive updating 'on the fly'. Please bear with us!